This file is especially incomplete because of the difficulty in assessing what works of art from this period, not having had the test of time, to include. Some entries overlap with the 1850-1950 period and may be found in that file. The dates following the artist’s name are often those of his period of greatest creativity, not necessarily those of the artist's birth and death. Medium: Oil pastels on paper; size: 30 x 41.8 cm. Mushroom description: allegorical mushroom, possibly a Mycena. Medium: Ink on paper; size: 97.5 x 190 cm. Medium: Oils on board; size: 14.5 x 14.5 cm. 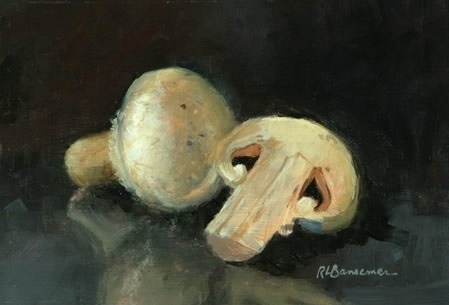 Medium: Oils on board; size: 19 x 16 cm. Medium: Cloth, wood, Foam; size: 63 x 60 cm. Medium: Oils on canvas; size: 120 x 165 cm. Medium: Oils on canvas; size: 66 x 64 in. Medium: Oils on canvas; size: 24 x 41 cm. Other examples of Henryk Fantazos' work can be found on the post-1950 page. Medium: Oil on ply-wood; Size: 100 x 113 cm. Medium: Etching, aquatint; size: 22.5 x 15 cm. Medium: Acrylics, collage, and graphites on canvas; size: 60 x 80 in. Medium: Ink, and acrylic on paper; size: 35 x 44.5 in. Medium: Painting using mixed media, acrylics, inks on canvas; size: 50 x 84 in. Medium: Acrylic, collage, graphite, on canvas; size: 48 x 72 in. Medium: Oils on board; size: 41 x 51 cm. Medium: Intaglio; size: 5.5 x 7 in. Reference: Schimmel, Paul and Mark, Lisa Gabriells, eds. Ecstasy. In and About Altered States. Cambridge: MIT Press. 2005. Medium: Acrylics on canvas; size: 8 x 10 in. Medium: Oils on canvas; 50 x 60 cm. Medium: Oils on canvas; size: 112 x 112 cm. Medium: Watercolors on paper; 35.5 x 23 cm. Medium: Oils on canvas; 46 x 55 cm. Medium: Gouache & watercolor; size: 16" x 12"
Medium: Gouache & watercolor; size: 8" x 6"
size: 190 x 230 cm. Medium: Archival Light Jet Print; size: Ed of 3 (per size), 21 x 27, 16 x 21, and 10 x 13 in. Medium: Archival Light Jet Prints; size: Ed of 3 (per size), 21 x 27, 16 x 21, and 10 x 13 in. Medium: Oils on canvas; size: 100 x 81 cm. Medium: Acrylics on canvas mounted on wood; size: 63 x 63 in. Medium: Gouache on Canson paper; size: 20 x 30 cm. Reference: Catalog Direkte Begegnungen, Galeria Bohemica. Werhangen, Germany. 2004. Note: Seen by K. Wöldecke. In H. Kreisel’s archive. Medium: Sculptures. Painted Steel and Canvas. size: (1) 225 x 94 x 64 cm. ; (2) 253 cm. x 94 x 64 cm. Reference: Colored illustration in Thoen's collection. Location: (viewed at exhibit) Rose Museum, Brandeis University. Location: (viewed at exhibit) James Cohan Gallery, NY. Medium: Sculpture. Epoxy, stainless steel, thermoset (sic), polymers, oils, urethanes, aluminum; size: 36 x 84 x 108 in. Location: Hirshhorn Gallery, Washington, DC. Medium: Oils; size: 50 x 40 cm. Mushroom description: Several kinds of boletus on a rustic table. Medium: Water-colors on paper; size: 14.5 x 14.5 cm. 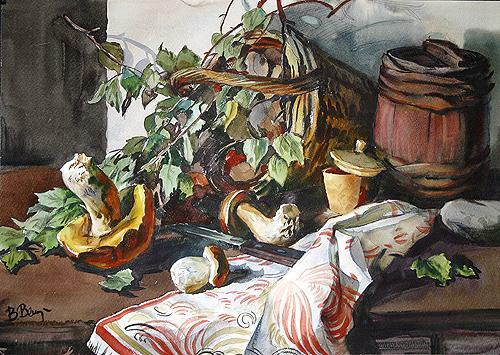 Medium: Watercolor on paper; size: 84.5 by 62 in. Medium: Orgalitis, oils; size: 61 x 70 cm. Medium: Oils on illustration board; size: 34.5 x 49 cm. Reference: Direkte Begegnungen, Galeria Bohemica, Wernhagen, Germany, 2004. Note: Seen by K. Wöldecke. H. Kreisel’s archive. Medium: Oils on cardboard; size: 30 x 42 cm. Medium: Cloth, wood, Foam, 63 x 60 cm. Medium: Acrylics on lame with pearl appliqué; size: 40 x 40 in. Medium: Oils on lame; size: 40 x 40 in.